Why Do So Many People Quit Driving For Uber? There’s a lot to like about driving for rideshare companies like Uber and Lyft, and most people don’t realize just how flexible it is until they start doing it. In fact, I can’t think of another job that would allow you to log on whenever you want and work as much or as little as you want one week, then do the opposite the next week. That would be a scheduling nightmare for a manager at a retail store, but Uber lets you do just that. And in some ways, it’s getting even more flexible with services like DailyPay that allow you to cash out your earnings at the end of the day. Now drivers have on demand work and even on demand pay — what other job can offer that? Clearly there are some unique benefits to driving for Uber, and that’s why there are hundreds of thousands of drivers who do it. But as any one of those drivers can tell you, driving for Uber can be very frustrating at times too. Even Uber’s own numbers have shown that half of all drivers quit after just one year. And since tech companies are known for cherry-picking data (Uber included), we can probably assume that things are even worse than that. So why are all these drivers quitting? I like to refer to the first few months of a driver’s time on the road as the ‘Honeymoon Period’. Most drivers are coming from 9–5 type employment, retirement or even unemployment, so Uber is the perfect answer to their prayers. And it’s actually a pretty fun job. You get to drive around in an air conditioned car, chat it up with a wide variety of people, and you get paid. Sounds a lot better than many of the jobs I’ve had in my lifetime. There really isn’t one big thing that causes drivers to throw in the towel though. Instead, there are a series of little things. A lot of these micro pain points are overlooked by drivers at the start because they’re happy just to have a job or they love the ability to set their own hours and work when they want. But these micro pain points can add up over time, and when some drunk dude tries to bring an open beer into your car for the thirtieth time or your door gets slammed for the hundredth time, it starts to get really old, really fast. Whenever I tell people that I run a blog for Uber and Lyft drivers, I get the same surprised reaction. Everybody knows how to drive, so it would make sense that working for Uber and Lyft would be pretty easy. But it isn’t. So while it’s not rocket science, there are some challenges you have to be able to navigate while driving. Being a rideshare driver is really a combination of customer service, safe driving, and running a business. Those are three pretty tough things though and since none of us grew up thinking we’d be Uber drivers some day, we don’t have any formal training in how to deal with a drunk passenger who also gets to rate you after the trip. And as most drivers will tell you, Uber doesn’t exactly do a whole lot to alleviate these issues. Unlike a traditional job, drivers who start with Uber don’t receive any formal training and in most cases, they may never even meet an actual employee from the company. Uber sends out a few 5 minute Youtube training videos, but you can imagine how many people actually watch them (I didn’t). Most drivers learn by trial and error, and it’s interesting to note that many drivers have never actually used the app as a passenger before signing up to drive. So drivers are coming in with no training and they may not even be familiar with Uber itself. The most viewed video on my Youtube channel actually advises drivers of the benefits of taking a ride as a passenger first, and it was also one of the big things I noticed in my Postmates on-boarding session. I’d placed dozens of orders as a customer before signing up to deliver, but we spent a majority of the on-boarding session going over how the general delivery process works. No one had actually used the app as a customer before. I hear over and over from new drivers that they are surprised by how little training is available, and they feel like they have no one to help them along with the process. It’s one of the reasons why my site has been so successful and I’ve devoted so much time creating resources like my video training course. 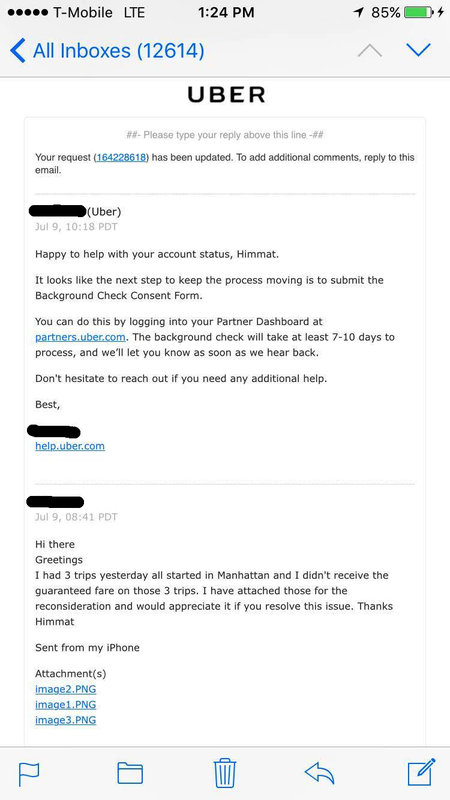 Beyond getting good help, even just contacting Uber can be a challenge. Over the past two years, my post on the top ways to contact Uber has been the most popular article on the site with over half a million page views to date. So you can imagine what it’s like for a new driver who has no one to talk to and may not even know where to go to get help — things can be rough. To be fair, Lyft is a little different in this respect, since they have you take a mentor ride where you get to meet a more experienced driver and that driver can briefly show you the ropes before you ever give your first ride. I am sure this program costs Lyft a lot of money, but I hear from a lot of new drivers who value this approach. It’s one of the reasons why I think all drivers should start with Lyft before eventually adding Uber, and it’s just a microcosm of the differences in company culture. Uber and Lyft have both advertised anywhere from $25/hour to $100,000 a year, but their numbers have always been misleading (Lyft is currently advertising $35/hr!) in my opinion. They don’t take into account their 25% commission and oftentimes, their earnings estimates have no basis on fact or reality. So you often get drivers coming in and expecting a much higher level of income than is realistic. There may be certain times and places when you can make $25/hr or even $35/hr, but I’d say a more realistic average income is $10-$20/hr. I got my first real job when I was 14 (as a chat room monitor!) and of the dozens of jobs I’ve held since, I’ve never received a sign-up bonus. Usually sign-up bonuses are reserved for athletes or super high in-demand technical roles. But in the on-demand economy, huge sign-up bonuses are prevalent for everyone. Lyft and Uber have both offered bonuses of up to $500-$1,000 in the past, yet the actual pay isn’t really in line with all the bonus money. Uber’s last $1,000 offer required drivers in San Francisco to do 100 rides, effectively a $10 bonus on each ride. We calculated the average trip payout of 45 rides recently in San Francisco, and it was only $5 after Uber’s commission! So the bonus in this case was actually double the actual trip earnings for the first 100 rides. As you can imagine, a lot of drivers are enticed by the sign-up bonus, but once that’s gone, there isn’t a whole lot of incentive to stay. There’s very little income variability in traditional service jobs, and if you have 10 cashiers who all start work at Walmart on the same day, they’re all going to make the exact same amount regardless of how well they perform. But obviously some employees are going to be better than others. With Uber, you could have 10 people start on the same day and after a week, they could all be making very different amounts of money. The savvy drivers will quickly learn to avoid chasing the surge, how to detect passengers trying to scam the system and when to reject a 10–15 min ETA. I don’t think a good driver is going to make double or triple what a bad driver makes, but there’s definitely an element of skill involved in being an Uber driver. I think a lot of it is common sense but let’s face it — not everyone has common sense. At the end of the day, some drivers are going to make more than others because they’re better at driving. Most full-time rideshare drivers are putting upwards of 1,000 miles a week on their vehicle. That’s a lot of miles and while it’s easy to calculate the cost of gas and deduct that from your earnings, the same can’t be said about depreciation on your vehicle and delayed expenses like the new brake job you’ll need two years earlier because of the thousands of miles you’re putting on your car as an Uber driver. When drivers are first getting started though, the expense side of things isn’t really on their minds. It isn’t until you look down at your odometer and say ‘Oh crap, I just put 10,000 miles on my brand new car’ that you start to consider the cost of operating a vehicle. The IRS allows for a 54 cent per mile deduction, but most economic vehicles are going to be about half that. Still, it’s an added cost and a large chunk of the 90 cents/mile Uber currently pays in many cities. And like with income, there’s also lots of variability on the expense side of things. A brand new 4 door truck will cost a lot more and have horrible MPG compared to a Prius, yet both cars are on the UberX platform. So for drivers, they really need to be considering what is the most economical vehicle that will get them the best return. I think this is one of the reasons why we’ve seen so much interest in Uber’s new Xchange Leasing Program and other flexible rental options since it allows you to see ALL of your costs up front. We’ve already touched on some of the general themes that lead drivers to quit, but I also wanted to highlight four specific areas that are major pain points for drivers. I’ve talked to thousands of drivers over the last few years and in my mind, these four areas play a huge role in why so many drivers leave the platform after such a short period of time. Although ‘being your own boss’ might sound like a good thing on the surface, there are lots of times when drivers are going to need help from the guys in charge. And even though Uber is constantly refreshing their help section, adding new options for drivers and testing new help features, their customer support reps still struggle mightily to address drivers’ most basic problems. Personally, I spend about 30% of my time responding to e-mails, so I know how hard customer support can be, and let’s just say I don’t envy their responsibilities. A lot of the e-mails I get from drivers are hard to decipher, illogical and not clear in the question they’re asking. Uber, to its credit, is good at responding to e-mails in a timely manner but the answers drivers get often seemed like canned responses and rarely help solve the problem at hand. I think a lot of these CS problems stem from the fact that Uber’s CS reps are not experts at being drivers themselves. In fact, Uber as a company doesn’t even allow its corporate employees to drive (although I’ve heard that’s changing). Either way, you can imagine what happens when you e-mail a CS rep asking about a basic, yet common situation. They just don’t know how to handle it. Situations like this happen a lot and it’s very frustrating for drivers because unlike a traditional workplace where you have a co-worker who can explain things to you, there’s no real-time help with Uber, and when you do manage to get help, it’s often not very good. I’d estimate that about 1/4 of the e-mails I get revolve around problems getting in contact with Uber or getting/waiting on an answer from them. I think the ratings system is great for passengers since it holds drivers accountable for their actions but there are a lot of ways it can work against drivers too. One of my biggest complaints about the ratings system is that it is a one-sided marketplace. Drivers have to maintain a 4.6 rating in order to stay active, but passengers have no such requirement. Uber recently added a feature to the driver app that allows drivers to see their 5 star ratings, but there’s still no way for drivers to see the feedback from their 1–4 star ratings. I get tons of e-mails from drivers who are struggling with ratings but they don’t know what they’re doing wrong. There’s just not enough transparency with the current system since you don’t know who’s rating you what. I also find that a lot of drivers take their rating very personally. I went out to drive the other night and started at a 4.94 stars rating. By the end of the night, I had done 6 rides for Uber and they all went great. But the next day, my rating had dropped down to a 4.92 and I had no idea why. Someone rated me low for some reason and I had no idea who it was or why it happened. It’s not so much the rating itself, since a 4.94 doesn’t get you anything that a 4.92 won’t, but it’s just frustrating to see your rating drop for no good reason. You could imagine that these feelings would be magnified if a driver was on the cusp of 4.6 and it determined whether or not they could stay active on the platform. Additionally, drivers are often rated poorly because of things out of their control like traffic and surge pricing. Even though these low ratings are going to happen to everyone and eventually average out, it’s silly that Uber doesn’t have a way for drivers to challenge specific ratings. They could easily drop the lowest rating or two each week or allow drivers to challenge a specific rating, and that would relieve a lot of the angst drivers have toward the ratings system. Uber has cut rates consistently for each of the past three years, and it’s always a contentious time when they do. Although Uber argues that lower rates mean higher earnings for drivers, over the past 2.5 years, I have yet to find a single driver who tells me they’re making more money after fare cuts. I don’t think anyone likes going into work one day only to have your boss tell you that you’re going to have to take a 20–30% pay cut and do the same amount of work (or more!). 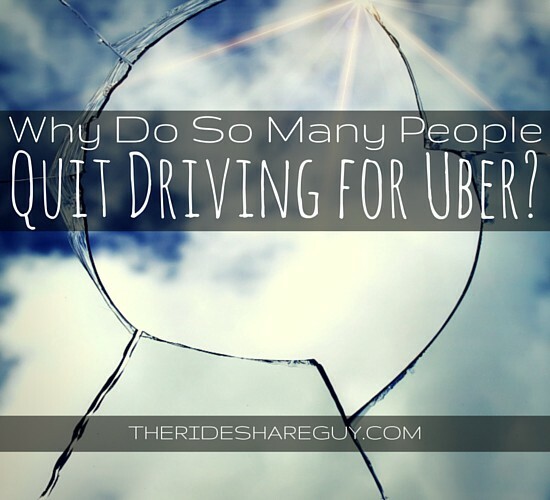 Fare cuts are clearly a big part in why many drivers quit. But Uber knows that there is an able and willing workforce ready to replace those drivers so drivers quitting isn’t really a big problem for them. The thing to keep in mind is that there are tens of millions of potential Uber drivers out there and none of them know what drivers ‘used to make’. They just compare the income and flexibility to how much they make at their current job and if the pay is reasonably close, it’s likely that Uber is the better choice. There’s been a lot of talk about how much Uber drivers should make, but at the end of the day, Uber is going to pay drivers as little as possible, but enough that they can maintain the quality of their product/service. You wouldn’t think UberPool would be a direct contributor to drivers quitting the platform, but it has definitely added to the frustrations of many drivers. UberPool saves passengers up to 30–40% on the cost of a ride yet it doesn’t do anything extra for drivers. Drivers are paid about the same amount of money on Pool rides yet they have to do a lot more work. Related Article: How much are drivers really paid on UberPool? I was recently in San Francisco on an UberPool trip as a passenger from the airport to the city. I watched three requests come in from a second ‘Pool’ passenger and every time, the new driver ignored it. He finally said to me, “I have no idea what the hell these beeps are, it’s my first day”. Of course I offered to help and ended up explaining how everything worked, but all I could think about at that point was how bad of an experience this guy’s first day on the job must have been. On my first day as a driver, I was nervous and just trying to make sure I could drive one passenger safely from point A to B, and here Uber is sending this new driver multiple Pool requests on his first day of driving. This is just one example of a new driver’s pain point with UberPool but it should illustrate the thinking (or lack of thinking) that goes into a lot of driver-side decisions made at Uber. There’s a big disconnect between working as a product manager for UberPool and what it’s like to actually be a new driver. That disconnect hurts drivers, passengers and Uber. What a lot of these pain points really boil down to is a customer-centric approach to building a business. It’s hard to fault Uber for doing things this way since frankly, a $62.5 billion valuation and $15 billion in cash is pretty impressive. But it’s clear with a lot of these policies that the real customer is the passenger and not the driver. If you’ve ever e-mailed Uber from your passenger account to complain about a driver or fare, it’s easy to get a refund or a credit. But drivers often experience the opposite. In many instances, drivers have even been temporarily deactivated for comments that passengers leave after the ride. You could be a 4.9 star rated driver with 10,000 Uber trips under your belt and if a passenger leaves a single comment that says something to the effect of ‘you were driving erratically’ or ‘you were drunk’, you will be instantly deactivated. And for whatever reason, passengers falsely accuse drivers of shenanigans like this all the time. More often than not, you can explain your side of the story and get re-instated within a couple hours, but still, should Uber really take the word of some drunk passenger with a 3.1 rating over one of its top drivers? Probably not, but they often do. And I think it’s this culture of “passengers first” that has caused a lot of retention issues for Uber. A lot of these pain points also highlight the disconnect between Uber employees and drivers. Uber is doing lots of cool things and releasing some amazing products and features, but first impressions matter. Uber is pushing the hell out of services like UberPool but it’s a terrible experience for drivers. That doesn’t seem like a recipe for success to me. Ultimately, Uber probably isn’t going to add a tipping function to the app or boost fares by 50% unless they have to. But in the mean time, I do think there are a lot of mutually beneficial issues that can be addressed right now. The problem is that employees at Uber don’t always understand what it’s like to be a driver and the issues they face every day, so who’s going to be the one pushing for them? I’m a rideshare blogger and entrepeneur. I run a blog and podcast for Uber and Lyft drivers called The Rideshare Guy.